Retired Rats: Why Retired Rats? It's all about the rat race. For years, we were on the road with all the other rats, trying to reach that blessed exit ramp to retirement. There have been many detours along the way. We have experienced recesssions, reductions in force, downsizing, self-imposed sabbaticals for cross-country moves, and other potential barriers to retirement, but we kept our eyes on the destination. It has been a long, glorious journey. We mapped out the travel plan over 30 years ago. We opted for a smaller cage and furnished it with love. The great thing about love is that you never have to remodel it, just take good care of it and it will last a lifetime. We knew that we would never win the rat race, so the goal was not to win, but to reach the desired exit ramp at age 55. Once exited, we could begin to wander the back roads of life without any destination or due date in mind. We have lived frugally, but we haven't done without the things that bring us joy. The only thing we have missed is time together. 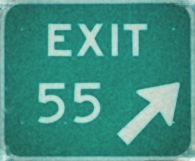 So, join these two rats as we take Exit 55 to early retirement.